When you download a file from the internet, quite often you cannot be 100% guaranteed that the file has not been changed in some way from the original. This could either be by the site you are downloading from, corruption due to errors in the download process, an individual who has uploaded the file for you, or possibly the most dangerous, the file has been infected by malicious software. One of the ways you can identify whether a file has been changed from its original state is to check its digital signature if it has one. Or you can check the file integrity by looking at the hash value. Put simply, every file has unique data contained in it, and when you apply a certain algorithm called a “cryptographic hash function” to it, a string value is returned which is only valid for that file in the current state. If any piece of data in the file is changed, even 1 byte, and you apply the algorithm again, the value given this time will be different to the first value. And with that information you can see if the file is not the same before trying to use it. So if you have something like an MD5 or SHA1 hash value from a website and want to check the integrity of the file you have downloaded, what do you do? Sadly, there is nothing available in Windows to help you out. What is needed is a utility to calculate a hash value using the same algorithm. Simply have a look at the tools below and use one of them to see if the hash value you have matches. This is a small and portable freeware tool that is able to calculate SHA1, MD5 and CRC32 values from any file you either Browse for, or drag and drop onto the window. 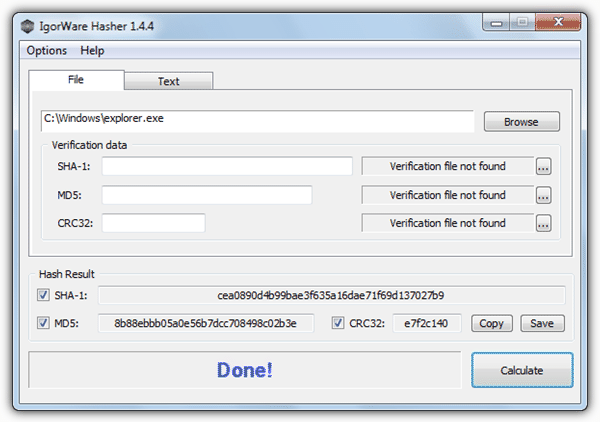 IgorWare Hasher can either copy or save the result to a .sha, .md5 or .sfv file for later verification. These can then be used to check the file at a later date, useful if a file is going on a USB stick or coming back from a less than fully trusted source. You can also generate a hash value for a block of text as well as adding a right click context menu option, automatically checking the file on drag and drop and choosing between upper or lower case values. IgorWare Hasher has separate 32bit and 64bit versions available and works with Windows XP, Vista, Windows 7 and 8. Do note the download is a rar file. 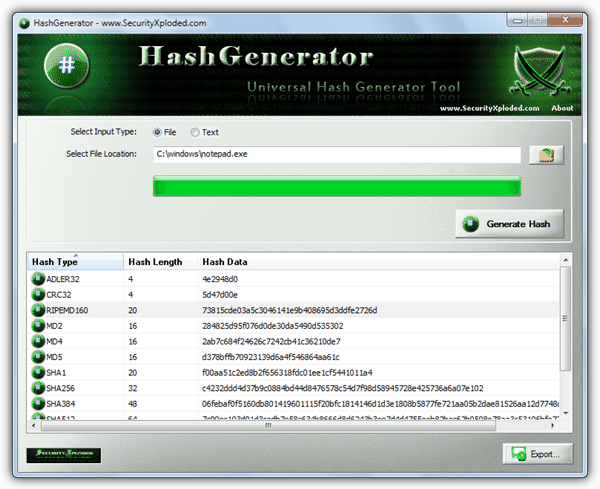 Hash Generator is by Security Xploded, a creator of many useful security related utilities. As with a lot of their programs, Hash Generator has both a portable version and installer in the same zip file so you have the choice. Although, all you get in the installer is a context menu entry and the option of installing a third party toolbar. Hash Generator is able to calculate the file’s hash data by either the Browse button or drag and drop, then pressing Generate Hash. A total of 14 different hash types can be identified including CRC32, the MD5 family, the SHA family, Alder32, RipEmd160, Haval256-4 and Whirlpool. Creating a value for a block of text is also supported, as is exporting the data to an html, txt or xml file. Hash Generator is freeware and works on Windows XP, 2003, Vista, 7. 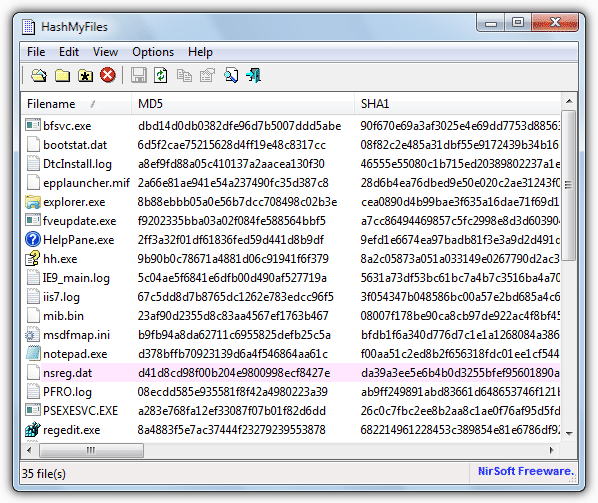 HashMyFiles is another small and portable tool from Nirsoft that is very useful at what it does. This one is perhaps more oriented towards batch hash file checking because you can add single or multiple files, folders and sub folders, running processes, and also adding by wildcard. This program can display hashes for CRC32, MD5 and the SHA family (SHA1, SHA256, SHA384 and SHA512) and also other information like created and modified times, size, version information and attributes. HashMyFiles is also able to put an entry into the context menu for right click integrity checks and also export the data to a text, html, xml or csv file. A number of command line options are also available. As with all Nirsoft tools, this is freeware and works on Windows 2000, XP, 2003, Vista and Windows 7. Even though this utility by comparison has nowhere near the features of some of the other tools listed here, I actually quite like it because it’s very easy and simple to use. Simply click the button and browse for the file, or drag and drop, then the MD5 and SHA1 hash values will automatically appear. If you want to verify the generated hash with a previous one, just paste it into the box and click Verify. The program could do with a progress meter for large files, but if you want a simple tool which just gives you the hash value with no frills, the MD5 & SHA-1 Checksum Utility is certainly worth a look. It’s freeware, portable and works with Windows XP, Vista and 7. 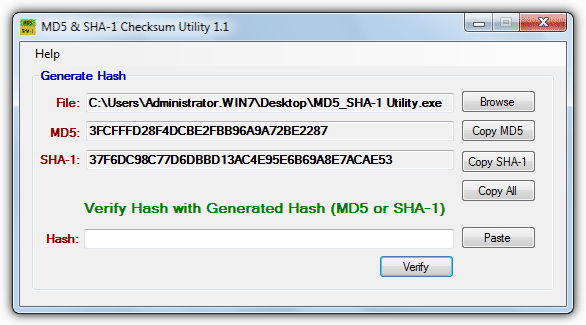 ComputeHash is a simple tool like the MD5 & SHA-1 Checksum Utility above but needs installing and is only accessed by right clicking on a file and clicking on “Compute Hash“. Again, it’s not loaded with functions, but gives you MD5, SHA1, SHA256, SHA384 and SHA512 values. Each can be individually copied to the clipboard, or all values can be exported to a text file. The program requires .Net Framework 2 or above, is freeware and compatible with Windows XP, Vista and Windows 7 32bit and 64bit. What I really want is a tool that will generate a CRC64 for single or multiple files / folder; And then append this checksum to the files “extended attributes” so that it is forever linked to the file. This would allow the file to be tested for corruption easily. (I know it is not perfect but good enough for most of us). It would also allow another program to quickly find potential duplicate files. This would be very fast as each file already has its own checksum. This seems a very simple idea – it must have been done – can anyone suggest suitable windows apps? I know I’m stating the obvious, but one reason this simple idea isn’t realized to the extent you would like is the fact that many, if not most, files change due to legitimate update via patches, and of course data files are frequently edited. And of course any compressed file in a lossy format will change if opened and re-saved. If you are comfortable with the command prompt, you can use my free utility, CrcCheckCopy. It compares large sets of files and creates a CRCstamps.txt file where you can see the crc of every file. The verification is done against the CRCstamps.txt. If Norton is really flagging all the files listed here then it is truly messed up. I tested at least half in VirusTotal and they came up completely clean. In my ESET AV and Malwarebytes as well. I have looked for an answer to this on several tech help sites. Every one of these sites fail in the same way. How do you automate the testing of the new hash against the developer’s official hash? These things can be quite long, making it easy to make mistakes. Some of the tools here have a verify option where you can paste in the official hash and see if it matches the hash from the file. Isn’t that exactly what you are looking for?? When manually checking only matching a few digits is enough …. P.S. this is from my personal experience. It’s not so likely but entirely possible to have two vastly different files and the first few characters of the checksum match, so that simply isn’t enough if you want to be totally sure the file is a 100% copy. How can ı found original hash values of windows 10? Also note that 7-Zip has hash checking built-in. Very useful info about hash value, thanks! I found this article very useful, Thanks! Thanks for mentioning ExactFile. Their console utility does a decent job when you need to process files within a large folders tree. Unfortunately it misses few advanced features such as including/excluding files by wildcards and it stores checksum of the whole tree into one file. Even though it has not been updated in a very long time (over 6 years!) it works well in XP through 10. Although it shows only CRC-32, MD4/5, and SHA-1, it also has the ability to *save* the MD5 check file for future verification. Another advantage over HashTab is that you can select multiple files and hash them all at once, and again, save the MD5 of all selected files together in a single file. +1 for HashCheck. Just grabbed it and it’s comprehensive and super-lightweight. Ability to handle multiple files and shell integration are musts. can i know if the file is melicios just by looking at the md5 signture ? if not , what is the best way to figure it out? You can’t tell just by looking at the signature, the only way to find out is to identify what the file is that matches that MD5, and then check if the file is malicious. For example, Googling your MD5 tells me that the file is gcBar.dll and it’s classed as “Adware” by some antivirus. I totally agree with taco, HashCheck is the best file integrity verifier you can get, despite it hasn’t been updated since 2009. Highly recommended. Just spent an hour trying to download latest version (5.0) of Download Hash Verifier. There are way, way, too many links labelled “Download” or something similar to determine the actual, magic link that will download the software. After the third return to the same Web page I finally gave up. I have the 4.5 version which seems to work fine. Or I may try one of the other alternatives listed here. If you are talking about the the SecurityXploded tool, I would agree it has quite a few download buttons to go through, although I managed to get the file downloaded in under 30 seconds. On the final page it will say “Here is your direct download link”, click on download link and the file will come down. Great tool HashCheck. Thank you taco! It’s the easiest to use and very fast and the best is that it seamlessly integrates into the windows explorer. MD5 & SHA-1 Checksum Utility for me. Lite and easy to use! This is a great post, but you missed the huge one. Microsoft’s File Checksum Identify Verifier. I ran across it while looking for a command line tool to quickly check some hashes and once I installed it to my Windows directory (to put it in the PATH), I can use it from anywhere on the system. It “only” does SHA1 and MD5, but that’s plenty for my uses. It’s a tutorial on how to use Hashes to check file integrity.